Opinion: Is work-life integration the answer? The never-ending tug of war between personal needs, family commitments and work responsibilities calls for Work-Life Integration (WLI), a potent solution for enmeshing the seemingly insoluble entities of human needs. Unlike the binary concept of Work-Life Balance (WLB), WLI observes the purposeful interaction and fulfilling unification of work and life. Rather than deciding one over another at the crossroads of work and life, WLI views work and life at an intersection point where different aspects of life reinforce each other. Motivated to support family, the fruits of one’s labour at work are born out of home commitments rather than a replacement of personal pursuits. WLI redirects our attention to the big picture where work, home the community and the self, affect one another and hence need to interact with integration. The enduring debate on succeeding in occupational life without sacrificing personal life emerged from a history of research on the amalgamation of work, family and personal life. WLI originated in the 1970s stemming from childcare programs for professional women. Historic social movements dawned in the mid-60s on the relationship of women’s careers and family along with working men’s role in parenting highlighted the myth of work-life separation, reiterating the time-tested ubiquity of work life integration. What started out as child-care support services eventually gave rise to workplace flexibility, accommodating not only working mothers but also the rest of the workforce demographic. Ultimately, WLI rests in the hands of human resource professionals to transform outdated ideas of balancing work and life and reintroduce into the workforce WLI that has been the silent herald of work life harmony all along. Today, though a majority of 82% of our Singapore workforce claim to be able to integrate work and personal needs, a minority of 6% still feel that they lack the flexibility to fuse both worlds. According to a survey by Ernst & Young, one-third of millennials desire better work-life management. With constant work awareness and home commitments, the Generation Y of Singapore appeals for a flexible schedule that WLI entails. WLI is viewed as a millennial rendition of the previously abandoned notion of Work-Life Balance. But little do we realize that the concept of WLI has long been ingrained in the Asian work ethic. The very architecture of the iconic Asian shophouse reveals the understated truth that WLI has always been an integral part of life. Working in the shops during the day sustains the life that families support in their homes upstairs. Work is hence seen as a subset of life as it not only sustains life but imbues it with a sense of purpose and accomplishment. Unlike Work-Life Balance, integrating work and personal life affords greater flexibility to workers as they can attend to either work or personal family needs according to self-made schedules as opposed to a fixed work rota. The western concept of Work Life Balance separates work and life as mutually exclusive entities. The word “balance” itself implies a sense of trade-off between work and life when in reality, they are not antithetical. Work Life Balance points to the proverbial abandonment of work or personal affairs as you step into the house or the office respectively. Instead, both entities can be mutually reinforcing as life skills can enhance work life and vice versa. Hence, as work-life balance suggests the notion of a quick fix, it is unsustainable in providing long-term solution unlike the harmonization of work and life. With talent retention and efficiency key to occupational success, companies are striving for WLI to reinvent productivity. IBM Singapore won the Work-Life Sustained Excellence Award by the Tripartite Committee on Work-Life Strategy for their consistent success in work-life strategies. Through regular company-wide surveys (IBM Global Work-Life Survey), they seek to understand each employee’s different work-life needs in how they manage work taking precedence over personal life and vice versa. IBM also establishes trusting relationships while reinforcing personal responsibility in order to maximize work productivity while optimizing working hours as employees become mobile and work off-site. Today’s technology also supports a working-on-the-go ethic through innovative mobile systems such as Lotus Traveller, enabling 70% of IBM employees to work mobile. Telecommuting with flexible work arrangements that empowers the roving IBM workforce epitomizes the ideals of work-life integration. Leveraging on technology in today’s mobilechronic era ties in well with Singapore’s principles of self-sustainability and non-complacency. Virtual online meetings undeniably save time and increases productivity for everyone. This is echoed by one of Singapore’s founding father Mr Lee Kuan Yew, “You know the Singaporean. He is a hardworking, industrious, rugged individual”. The work-life story of Eric Wong inspires adults with familial responsibilities competing their time away from work. As a father of a toddler, a son of elderly parents and in-laws, Flexible Work Arrangements (FWA) have eased Eric’s coordination of work and familial needs around the clock. Through such FWA, Eric could manage work with childcare and eldercare responsibilities, embracing an integrated work-life lifestyle. Working parents, especially, who subscribe to WLI, experience the harmony of oscillating between work and their personal lives. 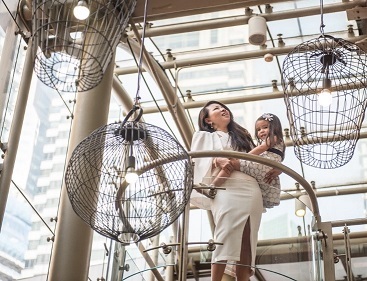 Mother of two, Lin Wanxuan who spends an eighth of her day commuting to and from work, optimises work time with Infocomm Development Authority (IDA)’s flexi-work and telecommuting programmes by participating in team meetings via video conferencing outside the office. The centripetal force of integrating work and life eased Mrs Lin’s duties of developing her children while pursuing her career. So long as you love what you do, the opposing tension between work and life would work itself out. With a healthier work-life relationship that boosts flexibility, company trust and work mobility, WLI enhances employee engagement, boosts morale and improves satisfaction through the fusion of work and life. The team at Brand Incorporated prides itself on incorporating work and life into a fulfilling purpose that sustains life. The time has come to start embracing the deep-rooted philosophy of WLI that has raised our forefathers and now lies before us to rise to the occasion of integration!